Sometimes we have the need to store Python object (class instance) to "object storage" server for some reason and then to retrieve it later. This post explains how to that by using Redis as the "object storage" server. DISCLAIMER: This post assumes that the machine where the code is executed and the Redis server is in the same machine or located within a secure premises. Store the object as "string" data type in Redis (https://redis.io/topics/data-types) and use the following formula for the key to address the object in Redis: "test-meta-webhook-" + object.subs_id , where subs_id acts as a unique identifier for the object. Retrieve the object string by using the same key used in 2. 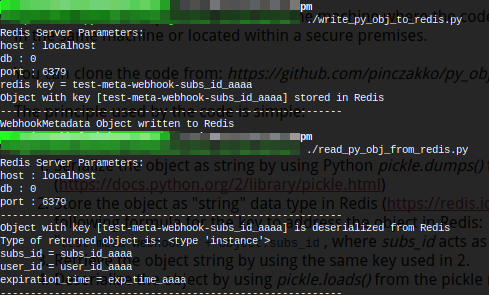 Deserialize the object by using pickle.loads() from the pickle module. Using HTMLParser class (https://docs.python.org/2/library/htmlparser.html) in Python 2 is rather easy if you don't need to pass parameter to your subclass for custom processing of the HTML tags. But, what if you do? This is rather trivial to do in Python 3, as seen here. The problem with Python 2, if you follow the "normal" way of invoking the parent HTMLParser class as explained at https://stackoverflow.com/questions/2399307/how-to-invoke-the-super-constructor , you would encounter error like this: TypeError: super() argument 1 must be type, not classobj. Now, how to fix that error? The error culprit is explained at: https://stackoverflow.com/questions/1713038/super-fails-with-error-typeerror-argument-1-must-be-type-not-classobj#1713052. However, it doesn't give us satisfactory fix for the error because you would need to mess with HTMLParser class for that to work. I prefer not to do it. This is where Python's type keyword comes to the rescue. The code below shows how to properly subclass HTMLParser in Python 2, it might not be pretty a.k.a it's a rather quick-hack, but it works. I used the type keyword in place of the derived class literal name. It's not foolproof though if ImgHtmlParser class has a child class, but in this case, it doesn't have one. So, we're OK.
"Install software updates. This case earnestly calls for installing the system security update MS17-010 for all Windows users, especially when Microsoft even released it for systems that are not officially supported anymore, such as Windows XP or Windows 2003. Seriously, install it right now. Now is exactly the time when it's really important." The explanation above specifically mentioned about MS17-010 Windows system security update, explained at: https://support.microsoft.com/en-us/help/4013389/title (the vulnerability is explained at https://technet.microsoft.com/library/security/MS17-010). What is not very clear is how do you check whether the update is already installed on your Windows machine or not. The steps are easy for Windows power users but not trivial at all for those not familiar with Windows Update mechanism. I'll show you how to do this on Windows 10 version 1607. You can carry out similar steps for other Windows version. First step, is locate the KB (Knowledge Base) number of the specific security update. So, we look for MS17-010 security update explanation. It's at: https://support.microsoft.com/en-us/help/4013389/title. 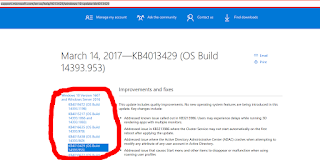 Scroll down to your specific Windows version, for Windows 10 build 1607, we found the KB number from the update file name: Windows10.0-KB4013429-x64.msu. The filename indicates the KB number to be: KB4013429. Now, we know what Windows update hotfix versions we need to check for. For our Windows 10 version 1607, the superseding hot fixes are: KB4019472 (OS Build 14393.1198), KB4015217 (OS Build 14393.1066 and 14393.1083), KB4016635 (OS Build 14393.970), KB4015438 (OS Build 14393.969). Therefore, if any one of them are installed. We're good. At this point, we can be sure whether MS17-010 or its equivalent is installed. 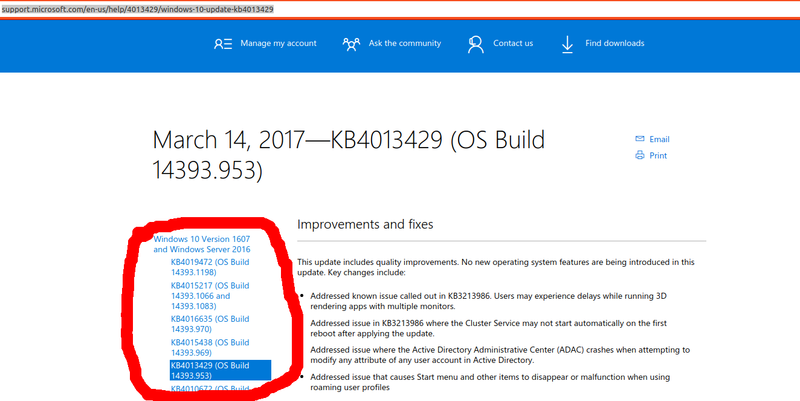 Hopefully, this helps those wanting to know whether their system has MS17-010 update installed or not. Signal handling in Windows console application is quite different from what POSIX defines. Well, you could do it the POSIX way if you're using Visual Studio (see: signal). But, the behavior is not quite like POSIX in all circumstances. The Windows native "signal" handling is the way to go if you're using third party compiler suite or cross-compiling via MinGW-W64. The native "signal" handling is also known as Windows Console Control Handlers. The Console Control Handlers are "reachable" via native Windows API. There is a peculiarity in Windows Console Control Handler compared to the way POSIX handle CTRL+C (SIGINT) signal. In Windows, a new thread is created by Windows which invoke the registered control handler to process the signal, see: CTRL+C and CTRL+BREAK Signals. Contrary, in POSIX, the OS doesn't run the signal handler in a new thread. Now, let's look at how you would implement a native Windows signal handler for console application. The Windows API that you need is: SetConsoleCtrlHandler(). As for, how to use the function, MSDN has it covered: Registering a Control Handler Function. 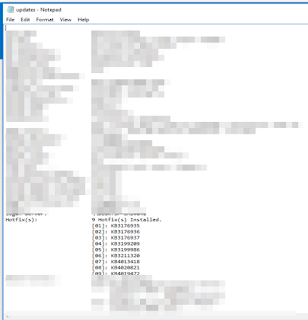 FYI, I have tested part of the routine with Mingw-w64 cross compiler suite and run the executable in Windows 10. I confirmed that it works as "advertised".